The Galaxy A50 is expected to be the most expensive Galaxy A 2019 series smartphone, at least judging by the recently leaked specs sheet. But, as the saying goes, a picture is worth a thousand words, so here is what the Galaxy A50 might look like in reality. 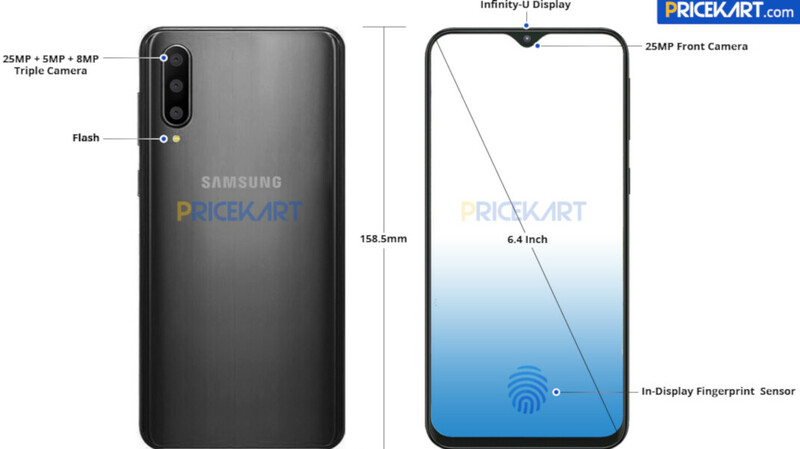 A press render of the Galaxy A50 leaked by PriceKart paints a nice picture for Samsung fans. The upcoming mid-tier handset looks quite stylish thanks to the thin bezels and a minimalistic notch that shouldn't bother customers who don't like it. The so-called waterdrop notch is part of huge 6.4-inch Infinity U Super AMOLED display, and makes room to a large 25-megapixel front-camera, which should allow users to snap exceptional selfies. We can also see the triple camera setup on the back side, which features a vertical layout, just like the Galaxy A9 (2018). The small LED flash isn't part of the camera island, but it's positioned right below the triple camera. The image confirms the Galaxy A50 will indeed feature an in-display fingerprint sensor, as well as both USB Type-C and 3.5mm audio jack ports. A loudspeaker is visible on the bottom side too, along with a tiny microphone. The Galaxy A50 will be launched in the first half of the year, alongside two other mid-range phones – the Galaxy A30 and A10. But before these devices will be made official, Samsung will introduce the anniversary Galaxy S10 flagship on February 20. Your opinion. But no it's not. I just don't understand why they have to make this a huge device too, when there are the A7 and A8 series too? These days almost every phone company makes gigantic devices! They should understand that not everybody wants a brick in their pocket! To me a 158 mm phone is too big. My S8 has a good size, not everybody needs much bigger phones than that. What i dont understand is the chin? Samsung galaxy A50 is the best phone with 6.4" display and 25MP + 5MP + 8MP camera.